But PS3 and PC versions are due out this year, so it's ok. Remember that time we were all "Tiny Brains is releasing November 15! You can bet your life on it!"? Well... it's not true. At least, not anymore. Developer Spearhead Games has pushed back the release of the co-op action puzzle game by about two weeks. Re-mark your calendars for November 26th! In a Facebook post late last week, Tiny Brains' publisher broke the "not as bad as we want to think it is" news, reminding everyone to pick up extra PS4 controllers to bring friends in on the four player co-op. The studio also mentioned that both PC and PS3 versions of the game will hit "this holiday season", giving PS4 owners a little less time to gloat over their exclusive stuff. 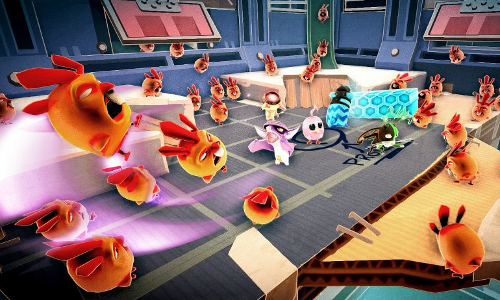 The, ahem, brainchild of Spearhead Games, a group composed of former Assassin's Creed III, Army of Two and Dead Space team members, Tiny Brains puts you and your co-op buddies in control of four lab creatures who have been experimented on so long that they develop super powers. They're all trying to escape from a mad scientist's experiments, but each level is like some sort of demented maze, complete with multiple solutions that can be reached depending on how you work through the puzzles. Each critter has a special ability that helps the team survive, and in order to do that, everyone's got to work together. No slackers! Look for Tiny Brains on PS4 this November 26th, complete with four player online and local co-op. Page created in 0.5673 seconds.